Beyonce performed her concert in the same tight and sequined costumes she has rocked all throughout her world tour, including her purple sparkly jumpsuit and a tight black leotard. Although Bey didn’t show much of a baby bump during her Zurich concert in Switzerland on May 17, it is still early in her pregnancy and she might not be showing yet! 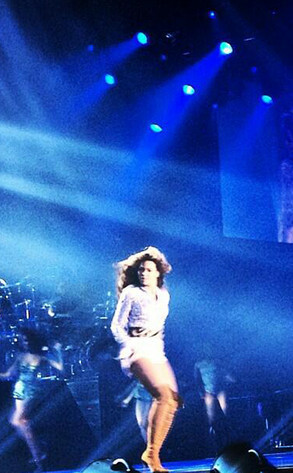 Celebrating her latest pregnancy news the best way she knows how — rocking out on stage for her world tour! It was indeed another energy-packed performance. Fans and concert-goers were so excited to see the R&B star’s performance, especially after exciting news broke on May 17 that she was expecting her second child. Some members of the crowd tweeted pics of the glowing mom-to-be on stage, and gave the Twitterverse a play-by-play of the energetic performance. I think Beyonce looks amazing!